If you suspect the presence of a high-impact plant pest or pathogen, the National Plant Diagnostic Network (NPDN) is your direct link to experts and researchers prepared to identify pests and pathogens and report them to the apropriate responders and decision-makers. Through the NPDN, you may also play an active role in supporting plant pathology research by submitting a sample for diagnosis. Locate and contact your respective lab by selecting your state from the dropdown menu below. Learn to submit a sample. You can take an active role in expanding knowledge about threats to U.S. plants by sending a strategically packaged sample of a plant, plant tissue, or pest to an NPDN lab. However, this must be done carefully to ensure that no pest or pathogen can be spread in the process. Learn to properly submit a sample and collect other important data by taking the First Detector e-learning module "Submitting Diagnostic Samples." The National Plant Diagnostic Network provides a cohesive, distributed system that identifies plant pests and pathogens of concern. The NPDN was established in 2002 in response to the need to enhance agricultural security through protecting health and productivity of plants in agricultural and natural ecosystems in the U.S. With support from the USDA-NIFA and through the collective efforts of many individuals representing Land Grant Universities, federal agencies, state departments of agriculture, and other stakeholders, the NPDN has grown into an internationally respected consortium of plant diagnostic laboratories. NPDN laboratories immediately report their findings to appropriate responders and decision makers. To accomplish this mission, the NPDN has invested in diagnostic laboratory infrastructure and training, developed an extensive network of first detectors through education and outreach, and enhanced communication among public agencies and stakeholders responsible for responding to and mitigating new outbreaks. 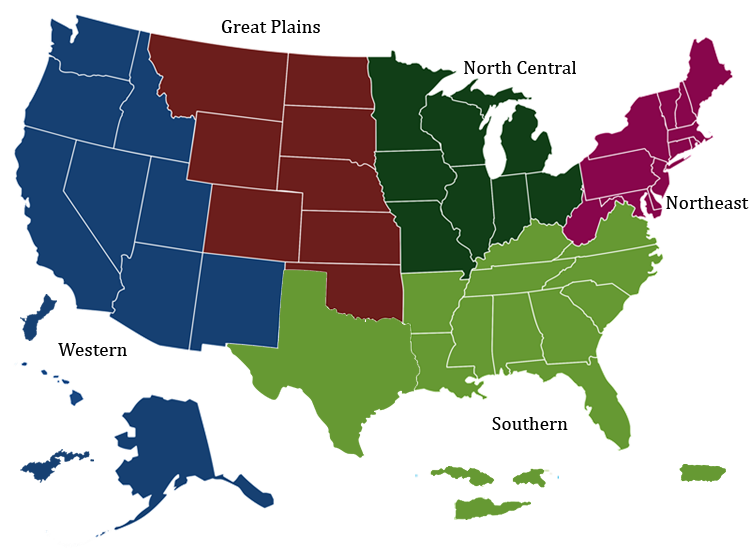 To address pests and pathogens affecting the diverse range of ecosystems spread across the U.S., the Network is divided into the five regions listed below. Learn more about the work being done in your NPDN region by following the links below. Western Plant Diagnostic Network consists of Alaska, Washington, Oregon, Idaho, California, Nevada, Utah, Arizona, New Mexico, Hawaii, Guam, and American Samoa. The regional center is at the University of California, Davis in partnership with the California Department of Food and Agriculture, Sacramento. Great Plains Diagnostic Network consists of Montana, Wyoming, Colorado, North & South Dakota, Nebraska, Kansas, Oklahoma, and North Texas. The regional center is at Kansas State University. North Central Plant Diagnostic Network consists of Michigan, Iowa, Ohio, Illinois, Minnesota, Wisconsin, Missouri, and Indiana. The regional center is at Michigan State University. The National Database is located at the Center for Environmental and Regulatory Information Systems (CERIS) at Purdue University. Northeast Plant Diagnostic Network consists of Maine, Vermont, New Hampshire, Massachusetts, New York, Connecticut, Rhode Island, New Jersey, Pennsylvania, Maryland, Delaware, and West Virginia. The regional center is at Cornell University. Southern Plant Diagnostic Network consists of South Texas, Louisiana, Arkansas, Mississippi, Alabama, Tennessee, Kentucky, Virginia, North and South Carolina, Georgia, Florida, Puerto Rico, and the U.S. Virgin Islands. The regional center is based at the University of Florida in Gainesville.